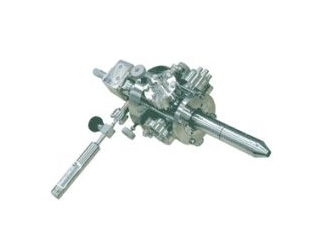 This ion gun is a compact design along with the ICF70 flange. Yet it achieves a high ion current density and also includes a vent column that removes neutral particles. The ion gun also contains a floating mechanism to achieve a low-speed, high intensity ion beam. It has a fully bakable structure to handle ultra-high vacuums. It provides high-speed sputter etching by high ion current density (>2 mA/cm2 @ 5 kV). It can focus the ion beam radius to or under 150 μm ( 5 kV). Floating lens mounted on it allows utilizing the ion beam for ultra-low energy from 10 eV to 5 keV. When differentially evacuated, it can maintain an ultra-high vacuum within the instrument during ion irradiation. Filament assemblies allow quick and smooth filament replacement.